Photo via anonymous reader, used with permission. 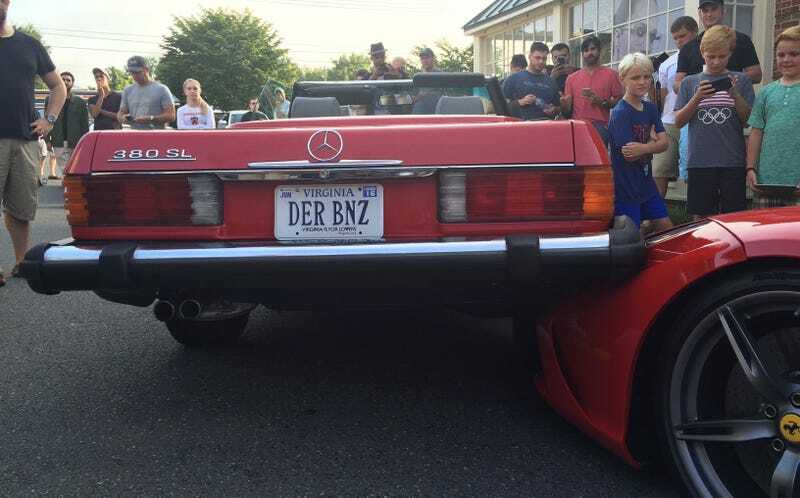 A beautiful, special Ferrari 458 Speciale minding its own business was horrifyingly mutilated at Katie’s Cars & Coffee in Great Falls, Virginia this morning when a Mercedes 380 SL parallel parked on the face of the $300,000 supercar. Children were watching! There were kids in the Mercedes! They’re going to have to live the rest of their lives knowing that the car they once considered a friend mutilated a Ferrari. Judging from our very own previous experiences at Katie’s Cars & Coffee, it’s a fantastic event with a lot of high-profile vehicles rolling through. Of course, accidents do happen, but most of the time these sorts of things go off without a hitch. I’m just glad nobody was hurt. Were you there? Do you have details or photos you want to share? Email me at the address below or drop them in the comments! Don't worry 458, you'll always be speciale to me.